All smiles after qualifying, but will it be the same after tomorrow's race? Following the antics in Azerbaijan, it's going to be a fascinating watch if Lewis Hamilton catches Sebastian Vettel in tomorrow's race. Lights out at 13:00 BST. Our coverage starts at 11:30. See you then. Sebastian Vettel will surely have to be on best behaviour tomorrow after clashing with Lewis Hamilton in Azerbaijan. BBC Radio 5 live's F1 commentator Jack Nicholls looks at why championship leader Vettel is on "incredibly thin ice" after being reprimanded by the FIA for his part in that incident. Jeremiah Kariuki: This bickering of handshakes just because it is @LewisHamilton makes no sense! Those doing it are not being fair on him! Dakter: Not a fan of Lewis, but he DID shake Seb's hand when he arrived on d scene. You don't often read the words "perfect" and "car" in the same sentence from Fernando Alonso but that's what he's put after qualifying 12th today, narrowily missing out on the top 10. "Happy for today's qualy laps," he wrote on Instagram. "Thanks to the team for the hard work yesterday night and this morning to have the car perfect for qualy. More to come tomorrow!" Lewis Hamilton needs a big performance tomorrow as he looks to cut the 14-point gap between himself and Sebastian Vettel in the drivers' championship. Best qualifying for a while for Palmer, less than 0.2secs off Hulkenberg in Q1. But he has been summoned by stewards for allegedly impeding Raikkonen. If Lewis Hamilton needs inspiration, he need only look at what Max Verstappen did last year. The young Dutchman started ninth on the grid but, utilising a one-stop strategy, was able to climb up to second. Hamilton starts tomorrow on super-softs, so will be able to go longer into the race than those around him, who are on ultra-softs. Not even the ignominy of having to wear a lederhosen-inspired race suit could ruin Max Verstappen's mood as he went from eighth to second at last year's Austrian Grand Prix.Image caption: Not even the ignominy of having to wear a lederhosen-inspired race suit could ruin Max Verstappen's mood as he went from eighth to second at last year's Austrian Grand Prix. 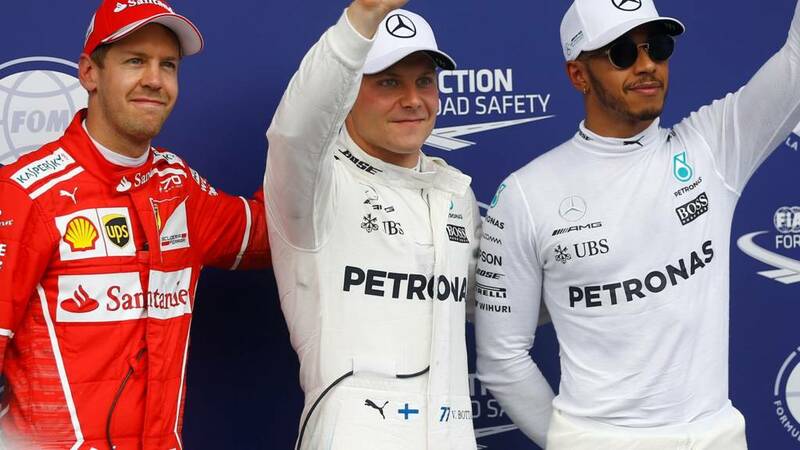 Pole position for Valtteri Bottas was the second of his career after he started on pole at the Bahrain Grand Prix in April. He also becomes the first Finnish driver with multiple pole positions since Kimi Raikkonen in 2008. In fairness to Lewis Hamilton, no-one likes being forced to make a public reconciliation. It also appears they did shake hands before they were on camera. Lewis Hamilton, third quickest in qualifying, but will start tomorrow's race from eighth after five-place grid penalty, said: "Congratulations to Valtteri and to Sebastian. They were both very fast. I did the best job that I could. "I will do the best job I can tomorrow. I want to get a one-two with Valtteri so will try to do that." Sebastian Vettel, who was second quickest in qualifying: "My lap was not quick enough but I am very happy. I was hoping for a last run but it was an anticlimax with the yellow flag. It is a great track, shame it is a bit short." Valtteri Bottas, who secured pole position: "I enjoyed it today. The car was getting better and better as the day went on and I'm very happy to be on pole." Colourful journalist Davide Valsecchi, conducting the post-qualifying interviews, tries to encourage Lewis Hamilton and Sebastian Vettel to shake hands after chatting to them. Valtteri Bottas delivered at every point during this qualifying session. I have to be honest with you - even if we had finished the session, I don't think anyone else could have beaten him. He very much deserves this pole position. Hamilton just didn't quite switch it on during qualifying. Sebastian Vettel qualifies second with Kimi Raikkonen third. Lewis Hamilton will start tomorrow's race from eighth after his grid-penalty is applied. Valtteri Bottas secures pole position for the Austrian Grand Prix.